In this article, exception handling is explored for Web API. The standard features from Web API 2 are shown as well as the global exception handling released in version 2.1. The following two examples demonstrates how the HttpResponseException class can be used in simple action methods. The HttpStatusCode enum can be used to set the response code. The first example returns a 301 (Paged moved exception) when the url ../exception/Moved is called. As the results show underneath, the HTTP status code can be set as required. This second example returns a bad request example if the id is larger than 3 with a HttpResponseMessage class as the HttpResponseException parameter. ReasonPhrase = "Your id is too big"
The results show that the message in the HttpResponseMessage is returned to the http client. Exception Filters can be used to handle unhandled exceptions per controller. These are registered in the filter provider in the Web API config. The WebApiConfig class in the App_Start folder is used to add the filter. And the filter can then be used in a controller. The action method contains no exception logic, this is all in the exception filter attribute class. The action method has just an attribute. 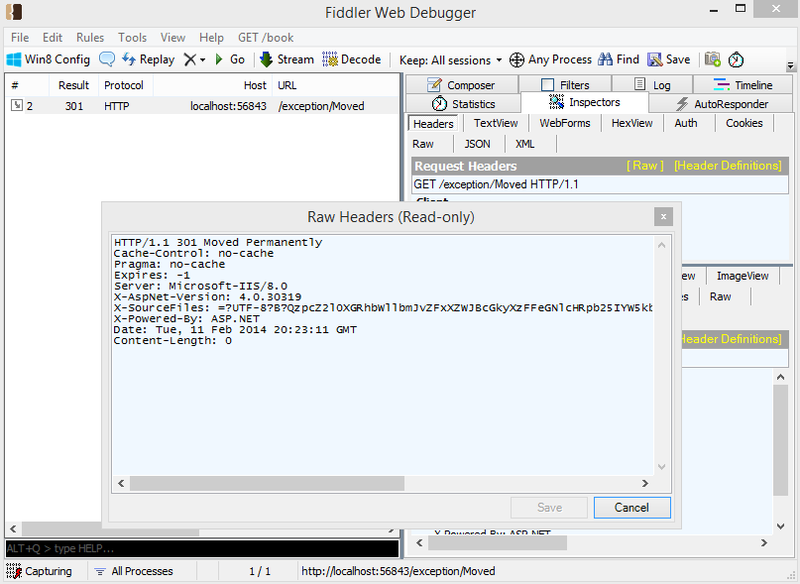 When the URL is called from the client, the ValidationException is thrown in the action method. This is then handled in the ExceptionFilter and returned as a Bad Request. NOTE: Even though the ValidationExceptionFilterAttribute class is defined on a separate action method, it is used for all action methods defined in the controller class. The following action method example will also result in the filter logic being executed, even though it has no attribute defined directly on the method or on the controller class. The ExceptionLogger class which inherits from the IExceptionLogger interface can be used to log all unhandled exceptions. If an unhandled exception occurs, the Log method will be called directly after the exception and before all ExceptionFilter attributes defined for the controller. 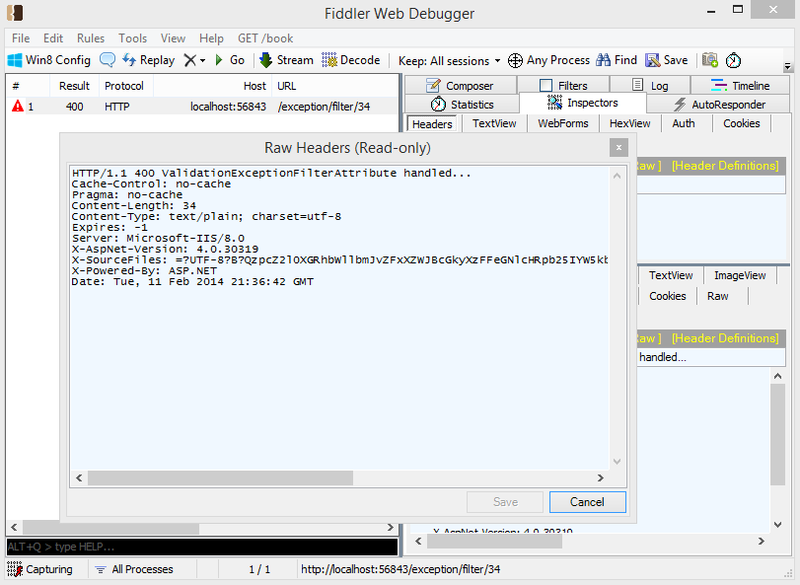 The IExceptionLogger implementations are added to the config.Services in the WebApiConfig class. You can add as many as you require. In this example, the exception is logged using semantic.logging to a elasticsearch persistence. The IExceptionHandler handles all unhandled exceptions from all controllers. This is the last in the list. If an exception occurs, the IExceptionLogger will be called first, then the controller ExceptionFilters and if still unhandled, the IExceptionHandler implementation. In the Web API config, the IExceptionHandler has to be replaced unlike the IExceptionLogger. Only 1 IExceptionHandler can be used for the service. This IExceptionHandler will only be called if the service can still define a response. IExceptionLogger will always be called. When adding an IoC for these elements, you need to add the container in the constructor of the IExceptionLogger, IExceptionHandler or IFilterProvider. 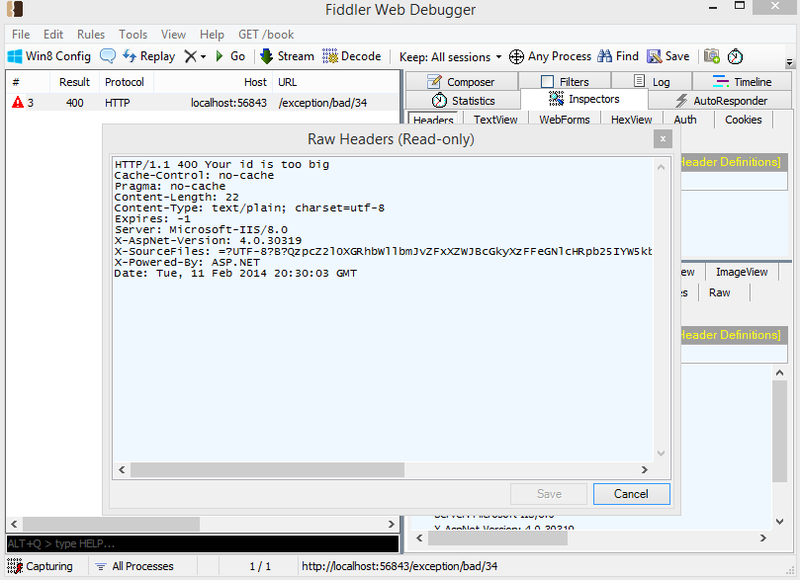 See https://damienbod.wordpress.com/2014/01/04/web-api-2-using-actionfilterattribute-overrideactionfiltersattribute-and-ioc-injection/ for details on how to do this. brockallen has created a great post showing when to use which code. This class can be used to return error information in a serializable container. It is just a key/pair collection. This class can be used in the Request.CreateResponse method which returns a HttpResponseMessage. The ApiContoller class also includes some methods for returning common HTTP status codes, for example InternalServerError() or InternalServerError(Exception). These methods can be used instead of HttpResponseException. You said “NOTE: Even though the ValidationExceptionFilterAttribute class is defined on a separate action method, it is used for all action methods defined in the controller class”. It happens because you set your attribute as a global filter. and attribute will be called only for the action you want to target. My have missed it. Any thoughts on handling an exception that, as an example, was thrown in the constructor of the controller? If you throw an Exception in the constructor of a controller, you can handle this in a ExceptionHandler class,ie the global exception handler as required. Why the Handle method from GlobalExceptionHandler is throwing a new Exception instead of setting the context.Result? It’s not really an exception, it’s a Bad Request response which sets to correct HTTP status code. I used your GlobalExceptionHandler example in my work. However, in my experience, when the HttpResponseException is thrown within the GlobalExceptionHandler class, the server returns the standard YSOD with a 500 error, regardless of what I put within the HttpResponseException. In diagnosing this, I came across someone having a similar problem with the 500 error and YSOD on HttpResponseException (though under different circumstances), and their problem had to do with their controller erroneously not inheriting from ApiController. Though, I was inheriting from ApiController. So as a test, I constructed a controller method that simply threw an arbitrary HttpResponseException when called. This worked as intended. This leads me to believe that expected handling of HttpResponseExceptions is intrinsically tied to ApiController objects (hence why attribute filters applied to and/or within a controller object, the way most examples online take care of the exception filtering, seem to work), so there might be a problem with your GlobalExceptionHandler example. thanks for this. Your dead right, I don’t know how I missed this. I corrected the example so that it works now. The HttpResponseException can only be used inside a controller or filter. Could you clarify if ExceptionLogger and ExceptionHandler get called for ALL unhandled exceptions. ?